After a successful winter test programme at Portimao and a useful BSB test last week, the Integro Yamaha squad are feeling well prepared to fight for a third consecutive Dickies British Supersport Championship crown as the series kicks off at Silverstone this weekend. Using revamped Yamaha YZF-R6 machinery Team Appleyard Macadam Racing refined their settings in the Portuguese sunshine before testing the latest spec Pirelli tyres at a chilly Silverstone test last week to ascertain tyre durability. With both Jack Kennedy and Brad Jones feeling fit and healthy and with a year of development on the latest generation R6, the team want to pick up where they left off last season and start collecting more BSB silverware. Dublin based Kennedy comes into the series as title favourite but will be looking over his shoulder not just at his rivals but also his young teammate Jones, who is looking to challenge at the front in this always competitive class. With the machines thoroughly refreshed at the Colin Appleyard Motorcycles workshops, the team will be looking to get a good set-up at the Northamptonshire circuit in warmer climes than the test. The format for the event at the shorter National commences with free practice on Friday, qualifying on Saturday before a 18 lap Sprint race on Saturday and a longer 26 lapper on Sunday. 2018 Champion Jack Kennedy said; “I’m feeling confident for Silverstone especially after our test there. I felt the only thing that let us down last year at this circuit was rear tyre life, which we have a new compound for this time around. We gained some positive info using this new tyre at the test which we can maintain a strong pace on over race distance. Brad Jones: “I’m really excited to get the season going, I’ve got a top bike and great team around me. We’ve had a productive pre-season so I’m feeling good on the bike. Round one is always interesting as that’s when you see where everyone is at, Silverstone is a brilliant place to gets things underway for the season opener and one I’ve been looking forward to for months! Team owner Robin Appleyard summed up: “Alex and the team in the workshop have worked hard this winter and after a couple of decent tests are raring to get going. 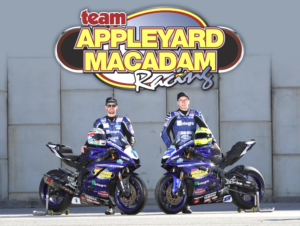 We’re proud once again to be spearheading the Yamaha Supersport effort along with Integro, Colin Appleyard Macadam and our new oil partner Rock Oil.